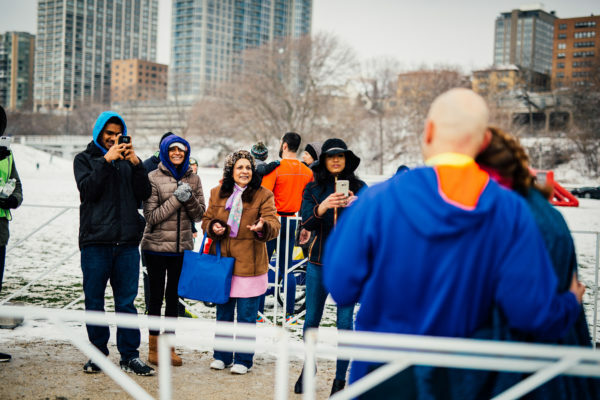 In addition to an April blizzard, the Brew City Run had everything– beer, bratwurst, and a finish-line marriage proposal. For race pictures, contact us. What was it like running Brew City? Jessica: [laughing] Well the weather was not ideal. It was randomly snowing on April 2nd but that’s Wisconsin for you [laughing]. It was very cold and windy at the start—it felt like little ice pellets were hitting you in the face. Once we made the turn up the hill by the War Memorial and got on the trail, the conditions got a lot better, but the trail was very slippery. The slush created a lot of drag—it felt like your feet were sticking to the trail. We put in a ton of speed work and thought we would be a little faster but the weather really slowed us down. Everything else was fine; the race, people, medals, shirts, and the hospitality were great! Manoj: It was pretty good. I got the same kind of ice hitting me in the face but my body warmed up quickly and my shoes stayed dry for the majority of the race. I went at it as steady as I could, avoiding as much water and slush as possible. When we hit the turn-off into the park, everyone’s bangs and eyebrows were caked in slush, that’s when I got hit with another cold wave and my shoes got wet—it got really uncomfortable. How do you push through the discomfort and weather? Manoj: We’ve run through some cold days with the wind-chill, so we’re kind of used to being uncomfortable. As long as the weather isn’t black-flagged, you’re dressed warm, and your shoes don’t go right away, you just power through. Jessica: Part of overcoming the discomfort is becoming comfortable with it, if that makes sense. You have to get over the fact that you’re going to be uncomfortable for a little bit but there’s a hot shower and pancakes waiting for you at the end so it’s not so bad. [laughing] Layers are really good because they keep you warm at the beginning—once you warm up, you can start shedding. And It also helps to have a running partner because then you have someone to talk to and distract you. Talking during a race is polarizing– some love it, others hate it. Jessica: I think it depends, maybe it’s because we’re so comfortable with each other. I don’t always like talking when I’m running but I don’t mind talking to him [Manoj]. Maybe it’s because I have to come home and live with him afterwards. [laughing] Just joking. Sometimes we’ll go a mile or two without saying a word especially if we’re running fast, but on the longer, slow runs we’ll talk about writing, running, our families, or make stupid jokes and tell silly stories—it makes it go by faster. Does talking prevent you from hitting your goal? Jessica: I think it actually helps because it takes you away from the discomfort. On days I run by myself, I run with music because I need something to unfocus the running and clear my mind. Then I can use running as a tool to make me feel better without checking how much time I have left. What was your first thought when you crossed the starting line? Manoj: I planned out what I was going to say at the finish line and was trying my best to go over the proposal. Congratulations on the engagement by the way! 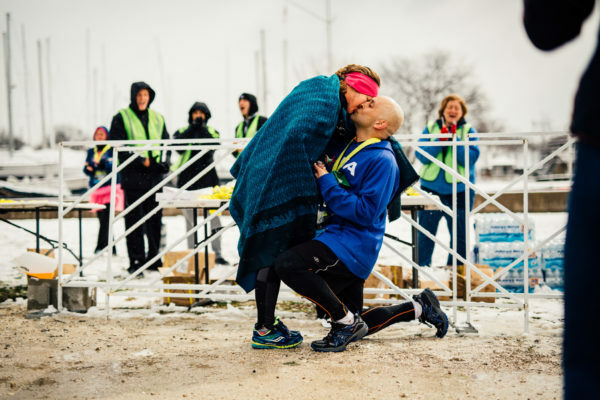 What inspired you to propose at the race? [laughing] So what was going through your head? Did it tip you off when he started running away from you? Jessica: [laughing] He’s a little faster than me so no. Were you nervous about proposing? 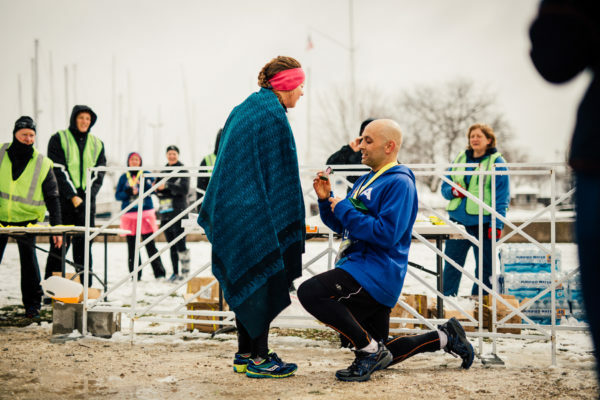 Manoj: Yeah, because you don’t want to forget or fumble over your words and end up on one knee and say, “Hey, how bout’ it?” [everyone laughs] And at the same time, I’m trying to focus on running fast and beating her to the line. Manoj: Jessica was on a good pace and a minute or two behind me, so I had to hurry everyone to the finish line, get the ring, and propose. You know how your brain gets all mushy at the end of a race? I didn’t know what was going on and then he started talking to me and I saw my dad, brothers, nephews, and his family and thought, “Oh, why is everybody here?” Then he got down on his knee and it clicked! Would you call yourselves runners? What does it mean to be a runner? Jessica: Yes. For me, it’s about about making a plan and having the discipline and dedication to follow through every day. Even on the days where it’s 20 degrees outside, or it’s pouring rain, or you’re tired, or you have a lot going on at work—running is the thing you have the discipline to do even when the rest of your life isn’t exactly going the way you think it should, or the way you’d like it to. Manoj: Yeah, I would say I’m a runner. For me it’s about perseverance—it doesn’t matter if you’re a casual runner, tired after a long day, or frustrated with work—you push yourself to make small improvements both physically and mentally—week by week, month to month, getting out there several times a week and lacing them up. Why do you sign up for marathons? Do you have any more races this season? Manoj: This year we’re trying to tackle 50 marathons in 50 states—it’s a way to do something adventurous, involves other people, and we get to travel to different places and experience new things. Jessica: I like the way it makes me feel, I know that sounds trite but when you’re done—even when you’re in the worst mood—you get that nice endorphin rush and everything feels a little better and it helps put things into perspective. And I also like the feeling of accomplishment. I’m very competitive when it comes to running, I like to feel like it’s something I’m good at. So when you see those incremental improvements within yourself, it becomes something you know you can do and work at to get better, and it translates to other aspects of your life. You are competing against other people, but you’re also competing against yourself. 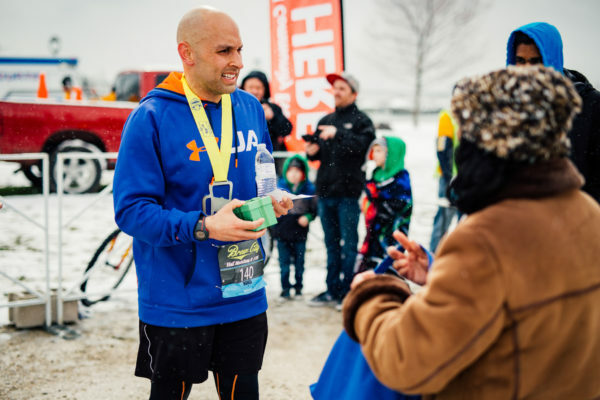 What advice would you give to someone new to marathons? Jessica: The best advice would be to make sure and give it another try after your first race. The first race might not go as planned so give it another try because it gets better and better. If you didn’t do as well as you hoped, don’t let it get to you, sign up for another one as soon as possible to get that bad feeling out of your head. Manoj: Take a ladder approach. Whether you’re running a 10 or 13-mile race, you want to slowly build that time on your feet and avoid getting discouraged by pushing yourself too hard, too fast. Find a formula that works for you, whether it’s running with music, by yourself, a partner, or in a group, just keep going and stay motivated. Jessica: Watch. I’m one of those people who has to spreadsheet everything so I need to know exactly how far I ran and how much. Jessica: Oh! This guy [Manoj] ran the Milwaukee running festival half marathon in a green, body suit, complete with an alien mask! Manoj: I’m going to have to vote for myself. Jessica: “Toenails are soooo… overrated!” with a big picture of a black and purple post-run toenail. It’s gross, but always funny. Manoj: “May the course be with you”–I liked that.